Anti-HIV drugs have extended life for millions of people, but they have never eliminated the virus from anyone. That’s because HIV integrates its genetic material into the chromosomes of some white blood cells, helping it escape notice of the immune system. 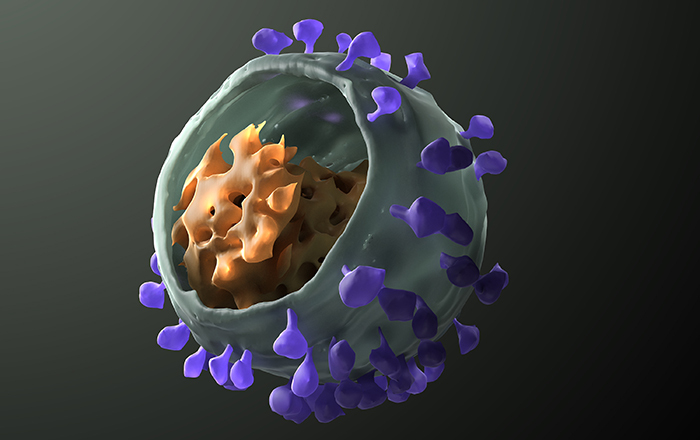 Two new studies show that artificial antibodies could “redirect” the immune response to these latently infected cells and help drain those HIV reservoirs in the body. But this creative strategy also carries risks. The two new papers, which only appear online so far, mainly involve test tube experiments. One, described in Nature Communications today, was conducted by a team from the Vaccine Research Center at the U.S. National Institute of Allergy and Infectious Diseases (NIAID) in Bethesda, Maryland. The second study appeared last month in The Journal of Clinical Investigation (JCI) and involved a collaboration between three universities and a biotech company. Both groups designed artificial versions of antibodies, the Y-shaped molecules made by the immune system to target pathogens. With natural antibodies, both “arms” of the Y clasp the same target. But the arms of bispecific antibodies each grab a unique protein. In this case, both teams designed their antibodies to clasp an HIV protein and CD3, a receptor found on the surface of white blood cells. The bispecific antibodies focus on the CD3 receptor for two reasons. One is that HIV hides its DNA inside white blood cells, or T lymphocytes, that have CD3 receptors. The other is that a second type of CD3-studded lymphocyte known as a killer T cell destroys HIV-infected cells. The bispecific antibody first binds to CD3 on cells that harbor latent HIV. This prompts the cells to divide, an “activation” process that wakes up the sleeping virus. New HIV proteins are subsequently produced that migrate to the surface of the cell. Now the bispecific antibody grabs a killer T cell that has a CD3 receptor and, with its second arm, finds a recently activated cell that has HIV proteins on its surface. Bringing the killer T cell in close proximity to the infected cell effectively stuffs the prey into the lion’s mouth. “The molecule works just as you’d hope it would in several assays,” says John Mascola, director of NIAID’s Vaccine Research Center and head of the group reporting the Nature Communicationsstudy. But neither team has yet shown that their bispecific antibodies can actually reduce reservoirs of HIV in monkeys, which are commonly used to study the AIDS virus. Those studies are underway, and it will take at least a year before either team tests the concepts in HIV-infected people. David Margolis, a virologist at the University of North Carolina, Chapel Hill, and co-author of the JCI study, says draining a reservoir ultimately may require combining bispecific antibodies with other latency reversing approaches and immune system stimulators like anti-HIV vaccines.